Healthy boundaries aren’t just good for your relationship. They’re essential. In fact, it’s nearly impossible to have a mature, healthy relationship without boundaries. The problem is that most of us think of walls when we think of boundaries, and that gives the impression of closing yourself off. But that’s not really what healthy boundaries do. Deepak Chopra uses a powerful metaphor to describe boundaries in a relationship. He says they’re like a screen door. A good screen door will allow a cool breeze to come in while keeping leaves and bugs out. Said another way, well defined boundaries keep the bad stuff out while still allowing the good stuff into your life. No one out there is perfect. Any guy you date is going to have flaws and imperfections, just as you do. And, there’s simply no way to check our baggage at the door when we start dating someone. If you have no boundaries in your dating relationship, yes, the two of you will be close. So close, in fact, that his issues will become your issues. That’s not a good thing. To keep that from happening, you need to make sure you have some healthy boundaries in place. That doesn’t mean you run from your partner’s issues. It means you accept the person, but not all his various moods, habits, and behaviors. Be willing to distance yourself from unhealthy behavior. For example, when your partner is having a bad day and seems to be wallowing in self-pity, don’t make the mistake of thinking your mood needs to match his. Empathize with him, but don’t join him. Just because he’s down in the dumps doesn’t mean you have to be. You want the cool breeze, not the leaves and bugs. Encourage communication, but don’t embrace the negativity. Here’s another example. You really like a guy, but the dog hair saturating the passenger seat of his car grosses you out. Don’t reject the entire relationship. Don’t reject him. Reject the specific thing that bothers you. Refusing to explain your discomfort does not protect the relationship. It just sets it up for failure. 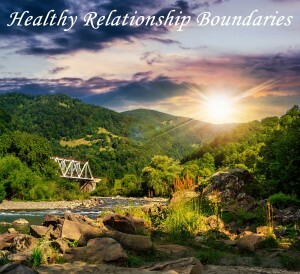 Healthy boundaries allow your relationship to flourish. Boundaries allow you to be yourself while still embracing your partner. Just remember the screen door metaphor. Love him and invest in him, but accept your right to do so without becoming a part of things that pull you down. This entry was posted in How To, Relationships and tagged healthy boundaries by James Bauer. Bookmark the permalink. So in the examples above… How do you suggest we set the boundaries. Can you be more specific? How can I empathize with self-pity bad hair days without going down that hill, how to react to self-pity and self-destroying bad days speeches, for example when his children want to go with the ex on his day and he then says he can’t even be a good father because they don’t want to spend time with him? Or in your second example. I love him, but his mother manipulates him and he falls for it, how can I set a boundary here, if it’s a sick relationship he has? It’s between the 2 of them, but of course it affects me. Hey Sam. Your first task is to make sure he knows the specific ways these things are affecting you. People can put up with a lot when it comes to their own family members. And sometimes they don’t realize the toll it takes on someone who is not a member of the family. Someone who lacks the social power to call people out on things and stick up for themselves and their own needs due to the necessity of being more polite than family members are to each other. When you date a parent, they are going to have bad days due to stuff having to do with their kids. And that’s a part of his emotional world. So it’s not something you can separate from your relationship. His moods and emotions will be affected by his kids just like they will be affected by his job or other things that are external to your relationship. So it’s good to be empathic and loving, a listening partner even if you don’t take responsibility for his decisions on how to cope. And of course there will be days when it’s a good time to ask for more time for yourself in the relationship, while other days will be the wrong time to bring up your own needs (such as a day when his emotional state makes him feel like everything is falling apart and he needs more time with his kids). The key here is communication…but patient communication. Recognizing there are days when he will be less receptive to your boundary setting and proactive conversations to create space for the relationship. And being patient as you wait for the days when he will be in a better mindset for planning and structuring your lives together to purposefully protect the delicate relationship you have both committed to growing together. When you talk about boundaries what if you been married for 24 years and said vows but one of you broke the vow that you promise to cherish and love an honor till death do you part. wouldn’t that be considered a boundary? Yes that would sure as @3%& be a boundary! I have been happily married for 47 years and we raised four children. My husband wants a divorce because he found himself a 27 year old. To me fidelity is a boundary and we did not have that many set in stone boundaries but that was one! Ok I agree having healthy boundaries is essential…with that being said when I have these boundaries and communicate them to the other person whether it be family, dating or certain friends they either ignore what I said or stop talking to me completely and it’s very frustrating. I communicate in a healthy and loving manner…Your thoughts?? Hey Shelly. I think a lot of us have shared your experience with negative reactions from others when we set boundaries. And they often do that even when you are very kind and gentle in the way you set your boundaries. The good news is, people who genuinely care about you will not simmer in their anger for long. They’ll come back. And those who never come back are people who just can’t deal with the boundary you set. In that case, it’s better to let them go. For people who ignore your boundary requests, you have to back away from them and help them to see that respecting your boundaries will be a condition for reestablishing interaction. I’m dating a guy who has Asperger’s syndrome. I like him very much cause he’s got very many qualities I value in a man, and he likes me, too, but due to his special condition it is hard for him to open up and communicate sometimes, especially o express his emotions and demonstrate his love for me. Are there any books or resources that could help me understand how to better communicate with an Aspergerian person? Thank you very much in advance! I really need help! First, “if you’ve met one person with Asperger’s, you’ve met one person with Asperger’s.” There’s no substitute for getting to know your guy as he is. The spectrum is very broad, and there is a wide range of behaviors and capabilities along it. Speaking as a diagnosed Asperger, there are lots of resources out there now for both the aspie and those who live with them. You might read Susan Moreno’s Partner’s Guide to Aspergers, Ashley Stanford’s AS and longterm relationships, or David Finch’s Journal of Best Practices. If you do your own searches, be sure to include “adult” in your search terms, since most resources are aimed at kids, and adults tend to have different issues. If I say so myself, we have lots of great partner qualities, and we’re well worth the effort for those who appreciate them ;). Thanks for that valuable comment, Anna. Re setting boundaries, I have 3 books written by Dr. Henry Cloud and Dr. John Townsend called BOUNDARIES, BOUNDARIES IN MARRIAGE; BOUNDARIES IN DATING. (Also includes workbooks if you really want to get into it). Amazing reading and insights. Recommend them highly if you want to throw the info out there James.